« Rich History, Bright Future! Auditions are open for all voice parts! Interested singers should have some choral experience, be able to maintain/match pitch, willing to attend and work in weekly rehearsals, able to practice on your own when needed (downloadable rehearsal CDs are available), and be open to having a fun time. Are you an alumni? Come back and be a part of our exciting 35th year! Auditions will be held on Monday, August 27, 2018, from 7:00 to 9:30 PM. We can make special arrangements if that night does not work with your schedule–just ask. 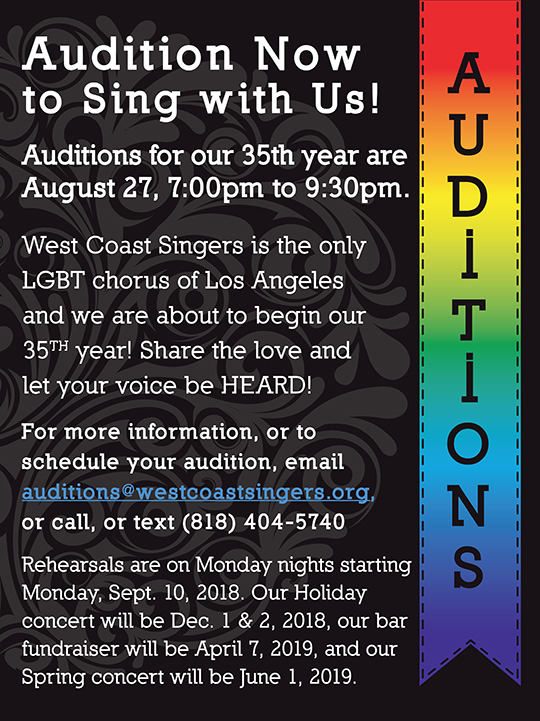 For more information and to set up an audition appointment, email auditions@westcoastsingers.org, or call or text (818) 404-5740. You can also download an application by clicking Audition Application. We rehearse on Monday nights and start our Winter season on Monday, September 10, 2018! Our Holiday concert will be December 1 & 2, 2018, our bar fundraiser April 7, 2019, and our Spring concert June 1, 2019.